So, the other day I said I was sharing my last set of INB pages from last year. 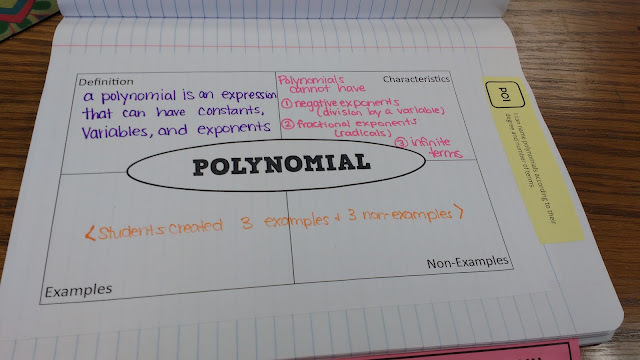 Apparently, I totally forgot about the existence of polynomials and radicals. Oops! So, let's tackle polynomials today. Polynomials started with a unit divider. 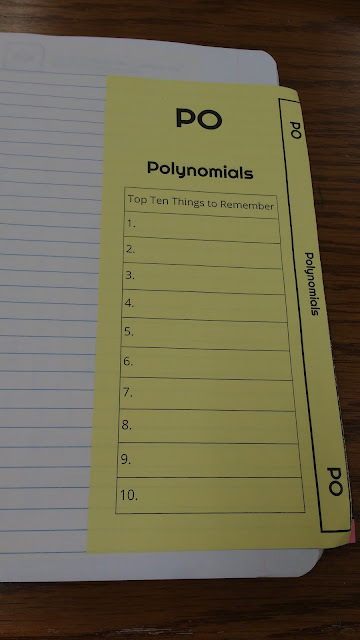 The front has a place for students to reflect on the top ten things to remember from that unit. The back has a list of SBG skills and a place for students to record their scores. We kicked off polynomials with a Frayer model. 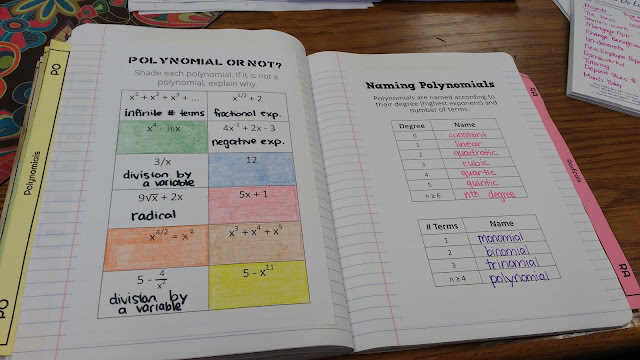 Next, we did some coloring as we practiced applying the definition of a polynomial. If the expression was a polynomial, students colored it. 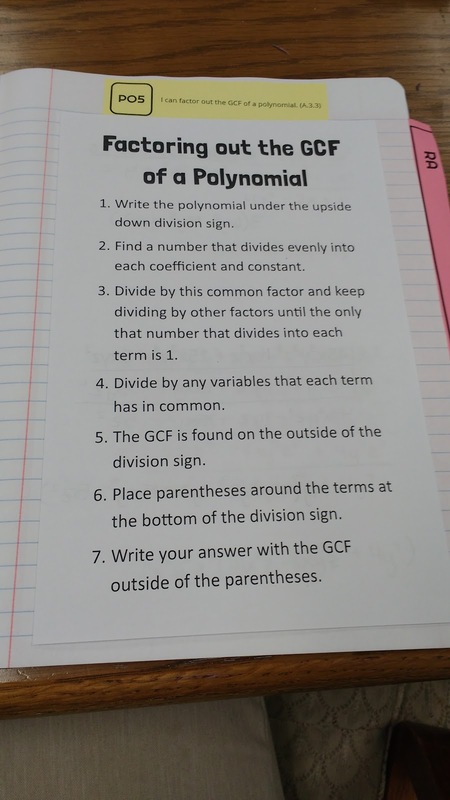 If it was not a polynomial, they had to explain why. I like this practice sheet because after I make up the first few polynomials to name, students usually suggest their own polynomials for the rest of the class to name! 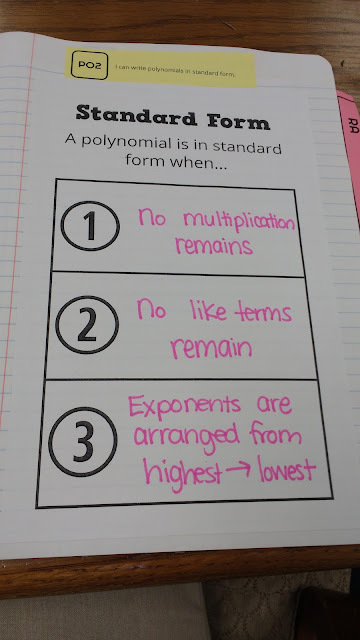 I added a new INB page this year to remind students what the requirements are for a polynomial to be in standard form. Then, we practiced taking polynomial expressions and writing them in standard form. 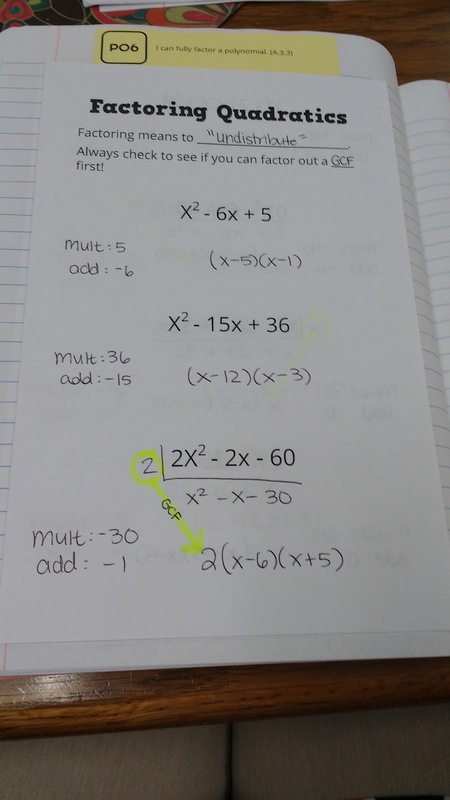 Multiplying Polynomials. 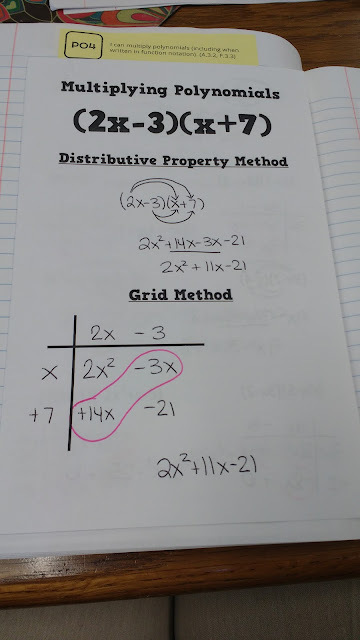 Guys, I cheated on the "Box Method" this year with the "Grid Method." But, I promise it's the exact same thing. It just seemed to tie better to what we had been doing with multiplying polynomials with algebra tiles. 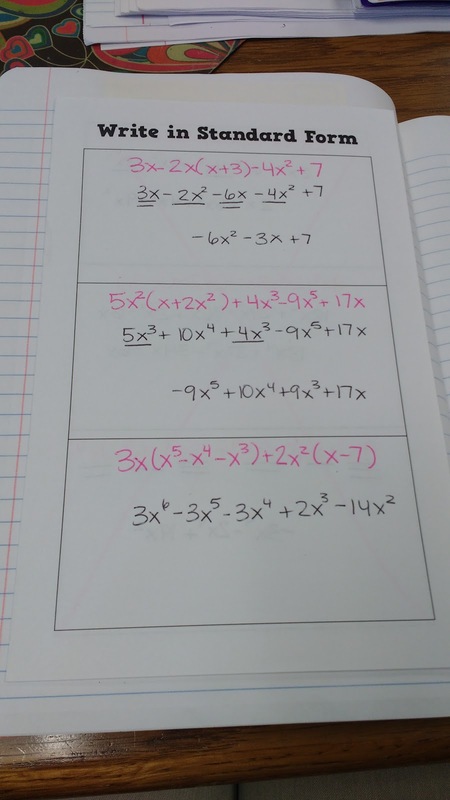 Factoring Quadratics. I had to make a lot of compromises with this topic that made me sad. But, I just didn't have the time I usually have for this topic. Oklahoma standards only require Algebra 1 students to factor quadratics with a leading coefficient of 1. Usually, I go above and beyond the standards and have students factor quadratics with other leading coefficients. 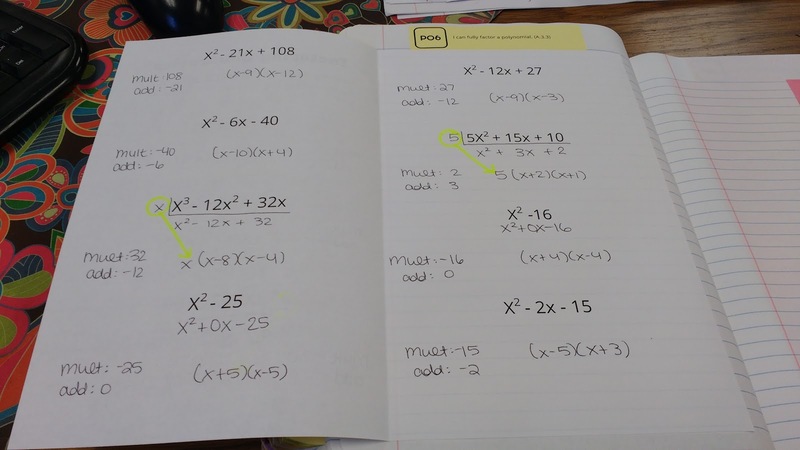 This means that students really need to use the box method. This year, I only did what the standards required due to time constraints. This meant that students didn't really see the benefit of using the box/grid method to factor quadratics. I personally think it's a mistake to set up the standards this way, but I'm not the one in charge. 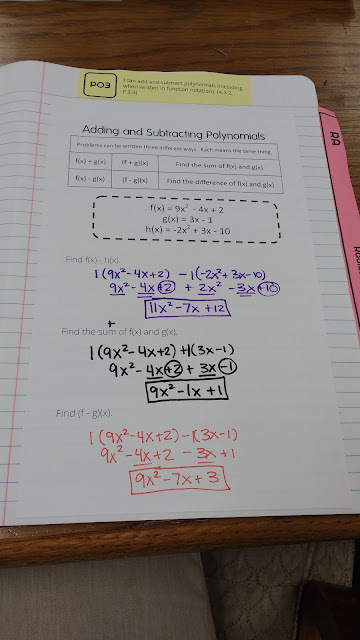 Files for these notebook pages are uploaded here. It's almost August. I report the 10th for New Hire Orientation. Where has this summer gone?!? 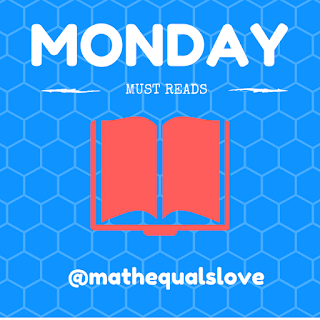 To help get myself in back-to-school mode, I decided it was time to put together a new volume of Monday Must Reads.This blog series is an attempt to highlight the awesomeness of other math teachers around the world. Hopefully you find a useful idea or two! Eric Appleton shares an intriguing use of manipulatives for discussing population density. 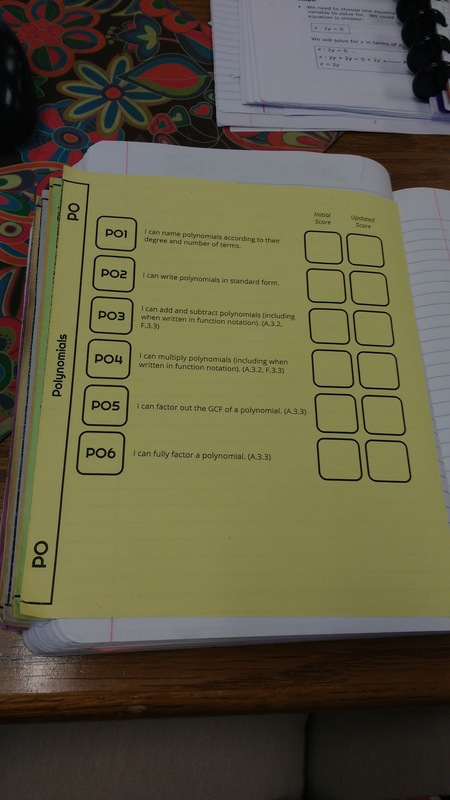 This outdoor unit circle from Alex Fogelson looks like a lot of fun! I love how Jason Thurmond hung a soccer player under each dry erase board and the name of the college they later went to play for above each board. So inspiring! This Quarter the Cross card sort from Amie Albrecht looks awesome! 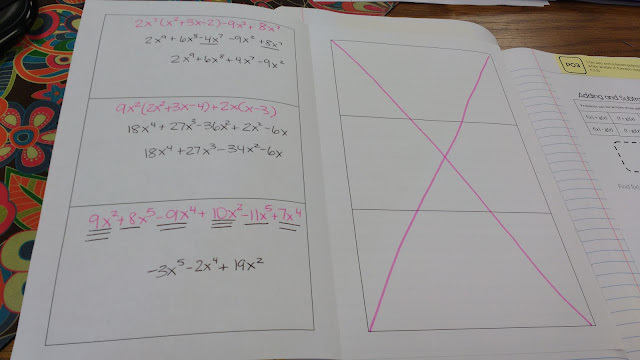 On the topic of quartering things, check out this task from White Rose Maths Secondary. 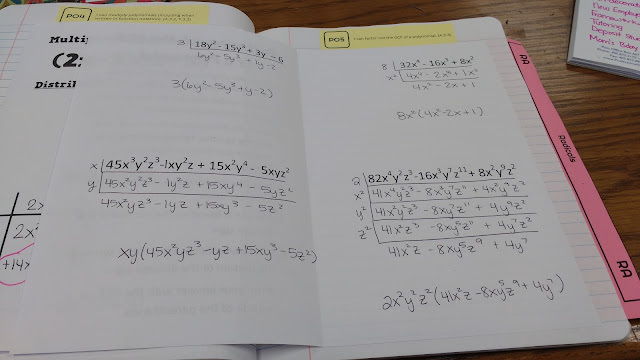 Here's another great task from White Rose Maths Secondary. Julia Anker shares an inspiring picture of her classroom. I need to have my students make unit circles to decorate the walls! I want to go and work at John Weed's school. Check out this life-size coordinate plane! David Butler shares a new use for cuisenaire rods: 3D vectors! Autism Plus Math offers up an interesting puzzle. 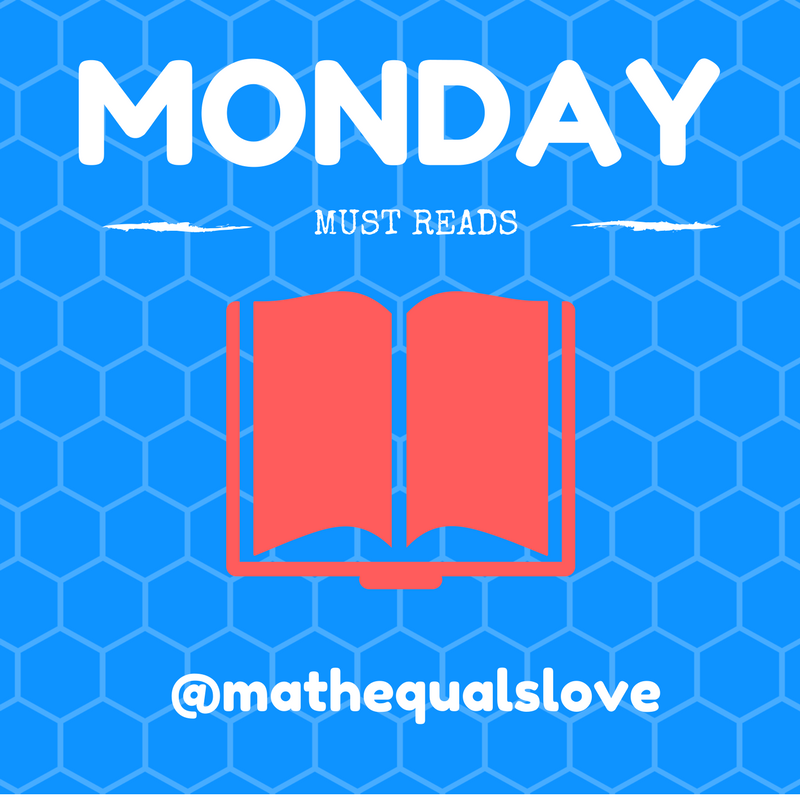 Shaun Carter shares some resources for using diamond problems in your classroom. Michele Walter shares a great linear regression task involving stolen cookies. This looks like fun! I also love this March Madness activity from Michele Walter! 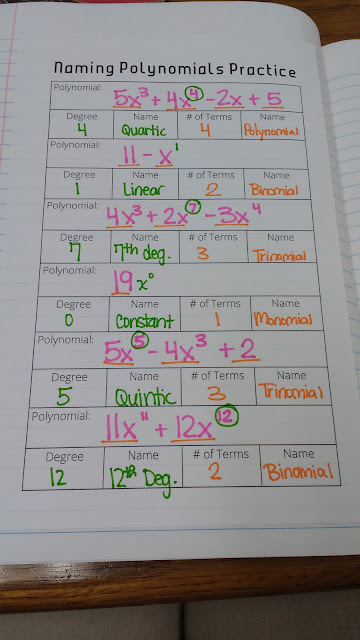 I love this finding pi activity from Annette Williams. The idea of acting out what happens to the mean/median/mode when extreme values are added is brilliant. Thanks to Reva Slone for the idea! Rebecca McKee inspires with trig bowties. 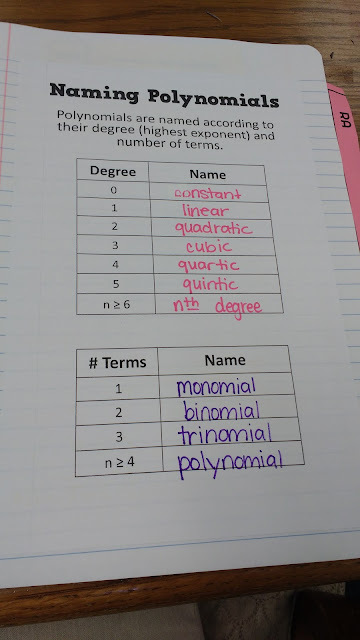 Can you tell I'm teaching pre-calc next year and looking for ALL the ideas? Cassie Reynolds has me wondering how I could use sticker surveys in my own classroom! Nicole Brooks shares a great idea for exploring surface area. This dorm room scale factor challenge looks fun! Thanks to Jessica Pacheco for sharing! 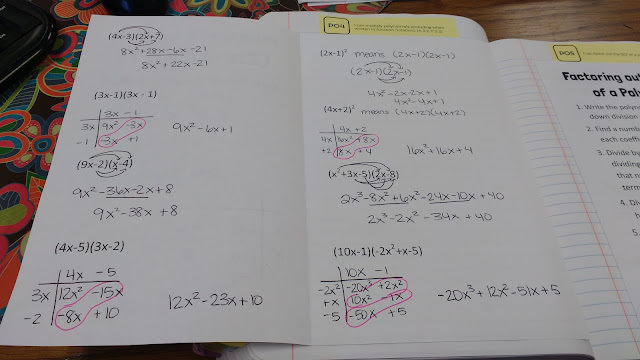 I love these open-middle and WODB problems for Pre-Calc from Tangentz. I can see this structure from Gareth Metcalfe being really useful! Thanks to Jo Morgan, I now know a lot more about the history of multiplication. Very interesting stuff! I've never quite seen this type of logarithm problem solved this way. Mind blown thanks to Patrick Beal. Kate Ross knows how to make AP Calc prep fun: Calculympics! Mary Williams shares a WODB for Absolute Value graphing. 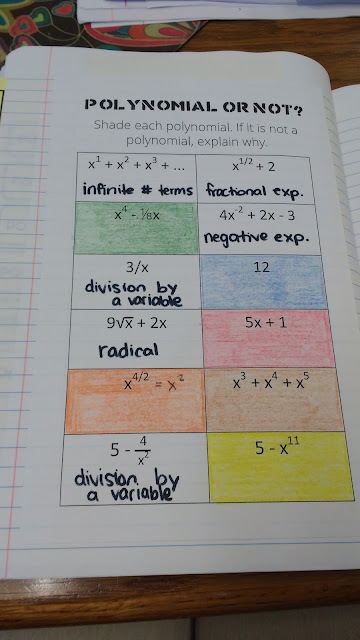 Love the idea of having students create their own! John Rowe shares a triangle based Open Middle Problem. Jossie Forman shares a brilliant introduction to Riemann sums. I also love how Jossie posts all the units for the year on the wall and moves an arrow to show where they are in the course of the units. This pop-up cube net from Miss McElderry is mind-blowing. Be sure to click through to watch the video! Chris Lee shares an interesting prompt based on an ad. Given the working, what was the question? Until next time, keep sharing those awesome ideas!